Every Mac user who wants to own an external hard drive often wishes to buy one that is Thunderbolt enabled. There’s only one reason for this. Thunderbolt hard drive have very fast data transfer speed. When Apple and Intel first released the Thunderbolt technology in 2011 on some Apple MacBook models, they created a technology that could “transfer data at speeds up to 10Gbps while providing the devices with as much as 10 Watts of electrical power on a single port without any hubs”. It’s only natural for an individual to try to find out The Best Thunderbolt external hard drive 2019 has to offer. It is possible to infer at this juncture that the main reason you’re reading this article is because you intend to get a Thunderbolt external hard drive that would serve your needs given the fact that most Macs, especially the MacBook laptops, come with an average 256GB storage. This table below shows you a list of some of the best thunderbolt external hard drives that will give you a value for your money. It includes their features such as storage size, weight and the OS they are compatible with, all at a glance. Here’s a proper review of these external Thunderbolt drives listed in the table above. 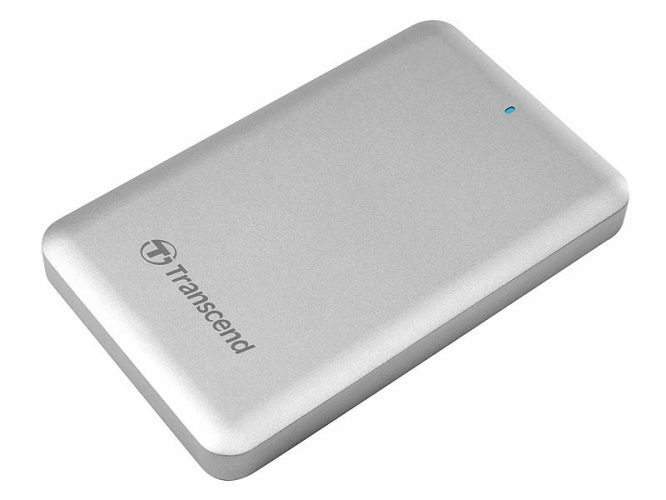 The few people that have had the chance to use the Transcend Storejet 500 Thunderbolt drive on their Mac have come to the conclusion that the Transcend Storejet 500 is one drive that doesn’t fall short of expectations – numerous five-star reviews on the product’s Amazon page bolsters that fact. The Storejet 500 certainly has an aluminum casing with a silver finish that makes it look fantastic when it sits beside your Mac on your desk. But that’s not the only thing, as the drive weighs just about 0.5 pounds and measures about 2.5 inches in its casing which itself measures 0.68 x 3.0 x 5.0 inches. The Storejet 500 packs the power of the Thunderbolt and USB 3.0 and as such is compatible both with a Mac and a Windows PC. However, the drive is more “Mac friendly” and works out of the box formatted for Mac in HFS+. Read and write speeds are good on the drive, even though they are quite lower than the numbers advertised by Transcend. The Storejet 500 comes in 3 different storage capacities; the 256GB, 500GB, and 1TB and it is worthy to note that all of them come equipped with Transcends’ Elite Software, as well as the 256-bit AES encryption feature. There’s a 3-year warranty covering the products. Compatible with Mac and Windows PC. USB 3.0 and Thunderbolt ports ensure fast transfer speeds. The drive sometimes gets hot under heavy usage. USB 3.0 is surprisingly faster than the Thunderbolt during transfer operations. Conclusion: The Transcend Storejet 500 is ever ready to handle your storage without any problems other than the fact that it disappoints Thunderbolt fanatics when it comes to transferring speeds of data. This drive was designed by the internationally renowned industrial designer Neil Poulton and it looks similar to its siblings in the LaCie Rugged drives family. The drive has a brushed aluminum enclosure with an orange rubber bumper running the edges. There’s a removable cap that covers the USB 3.0 (backward compatible with USB 2.0) port which unfortunately requires power supplied to the AC adapter for it to work. There’s a LED power indicator that shows drive activity. The Thunderbolt port, on the other hand, is bus-powered and can handle transfer speeds of up to 240MB/s according to LaCie’s claims. There’s more than enough storage space on the drive as it ships in 2TB or 4TB storage capacities and offers users the option of choosing either the RAID 0 or RAID 1 options for the drive. In terms of ruggedness, the LaCie Rugged RAID drive lives up to its name. It can survive a fall from a 1.5-meter height and can withstand weights of about 1 ton placed on it as well as being water and dust proof with its cap on. It’s compatible with Windows PC though it requires reformatting. Here’s a video of a Range Rover running over the drive. There was a crack sound, and the drive got damaged. However, the owners were still able to retrieve their data from the drive. The Thunderbolt cable on the drive is housed in a groove on the drive’s body. The LaCie Rugged RAID drive also ensures your data is protected with its 256-bit AES encryption feature. Thunderbolt cable is housed in the casing. The drive can’t withstand weights of 1 Ton as claimed by LaCie. USB 3.0 port should have been bus powered like the Thunderbolt port. Save for the fact that the USB 3.0 port requires AC power to work, the drive would have received a high five here at HDDClub. Nonetheless, it still gets our thumbs up. Conclusion: Weighing just 1.2 pounds and measuring about 1.3 x 3.8 x 6 inches, the LaCie Rugged RAID 4TB is a must have Thunderbolt external hard drive for Mac users who are always on the go. For individuals who are often on the move especially to rough terrains prone to noises, vibrations and other elements like water and dust, this drive will certainly take care of itself and your data. Previously we recommended The G-Technology G-Drive Pro which was a high-capacity storage device that features four 2.5-inch drives with a RAID 0 configuration. 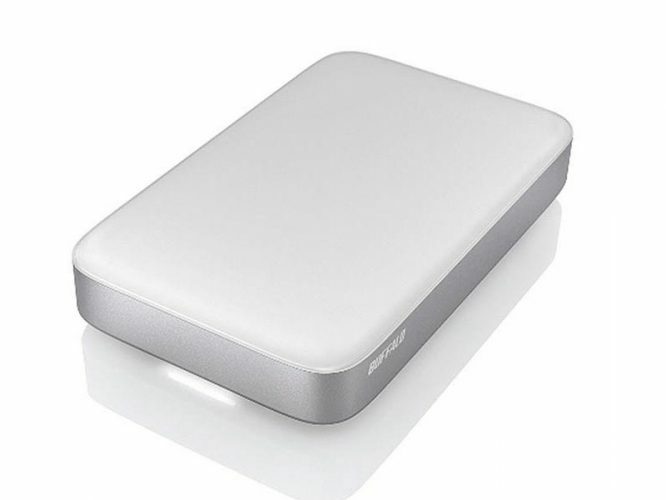 It’s basically designed to be used by Mac users who are looking for a sleek and heavy-duty storage media that comes with loads of connectivity. However, this model (The G-Technology G-Drive Pro) is no longer in production and is being replaced with a newer model having the same name. Now here’s the problem: this newer model is actually an SSD, and as such costs way more than its previous model. If you can afford it, it can be a really excellent storage solution, but we recommend less expensive models. What are the G-RAID Drives? The products in the G-RAID line provide excellent storage capacity and unique connectivity at a very affordable price. Basically, they are made to serve entry-level media professionals who are looking for compatibility with a huge variety of interface types. There are basically three products in the G-RAID line: Removable, Thunderbolt 2, and Thunderbolt 3. However, I don’t really recommend the Removable variant since it’s way slower than the other two at just a really small price difference. The G-RAID Thunderbolt 2 is a 7200 RPM Class hard drive (hdd) which boasts transfer speeds reaching up to 480MB/s. Due to its ultra-fast transfer rate, it can easily handle even the most demanding creative products and even support 2K as well as 4K compressed video workflows. On its back portion, you can see an I/O panel which includes a number of ports such as Thunderbolt 2, power input, and USB 3.0. Capacity-wise, you can say that the G-RAID Thunderbolt 2 is an overkill. It comes in different variants starting from 8TB to a massive 20TB of storage. Also, its appearance is simple yet sleek with its aluminum design and removable drives. 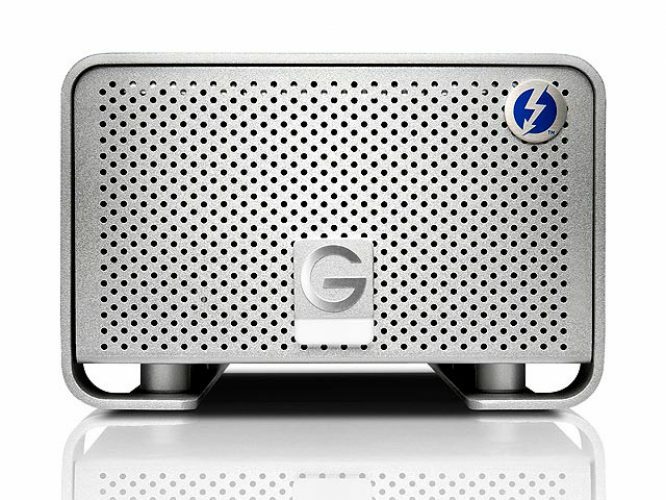 The G-RAID Thunderbolt 3 is almost similar to the Thunderbolt 2 except that it’s a lot faster and comes with a few additional features. Basically, it can reach transfer rates of up to 500MB/s. Aside from that, it can support USB-C, HDMI, Thunderbolt 3, and 4K interfaces. There are also five options to choose from when it comes to capacity, with the lowest one at 8TB and the highest at 24TB. Despite its good performance and massive capacity, the G-RAID Thunderbolt drives have their share of pros and cons. 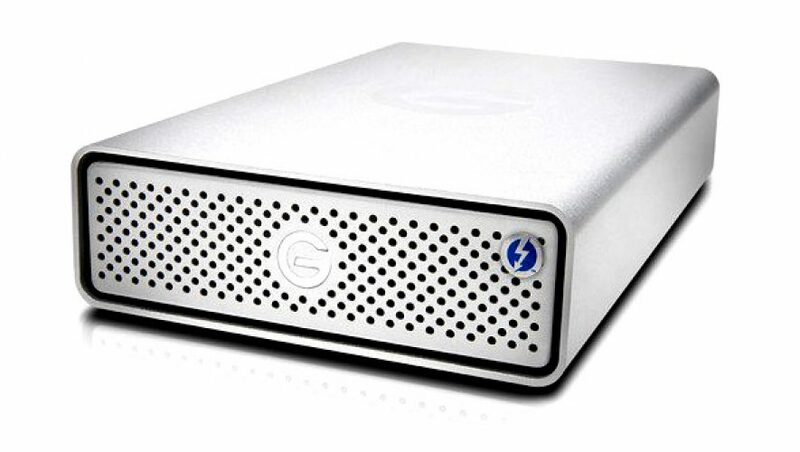 Overall, the G-RAID Thunderbolt is a well-performing storage device. 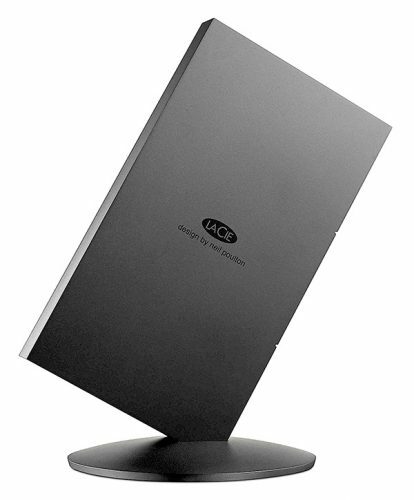 It offers excellent performance and fast transfer speeds compared to most of the Thunderbolt drives on the market. Aside from that, its large capacity offers you plenty of room for all your important media and documents. Perhaps the major turnoff is its relatively high price. Nonetheless, if you can afford it, it can be a really excellent storage solution. Even though the drive is named a Buffalo, it surely isn’t as large as that. For an average user, Buffalo Technology’s Ministation indeed houses a mini 2.5-inch HDD and weighs just about 0.5 pounds. The drive measures 3.2 x 0.9 x 5.1 inches and is enclosed in a simple and sleek aluminum casing and is certainly going to catch the eye of anyone seated right beside you. We can describe the drive as being able to give someone the three S’s people love in hard drives: storage, style, and speed. It actually provides the first two without any complaints from us, but certainly not speed as the transfer speeds are quite slower than some of the aforementioned drives on our list. That notwithstanding, it still does great transferring files through its USB 3.0 and Thunderbolt ports, which of course can be daisy chained – at the end of the chain since there’s no second Thunderbolt port. The Buffalo Ministation is bus-powered, unlike the G-Tech G-Drive that requires an AC power source for it to work. Buffalo Technology, has generously included a Thunderbolt and USB 3.0 cables in the box, so you don’t have to go running around for any of those. Simply, open the box, connect your Thunderbolt cable to the Thunderbolt port and connect to your Mac, and begin transferring your files. It’s that simple. However, if you are using a Windows PC, you’d need to reformat the drive first before it starts working on your PC since it is formatted for Mac by default. Lacking a second Thunderbolt port limited this drive to the end of a daisy chain. Aside from that, the Thunderbolt connection may disappoint at any time as reported by some users on Amazon. Conclusion: The bad sides of the drive notwithstanding, there is absolutely no reason why no one shouldn’t purchase such a super cool drive which doesn’t require any other peripherals. If you aren’t keen on taking your external hard drives about, and storage is very important to you, then you need to get yourself the G-Technology G-RAID drive which has enough space to store as much as 8TB worth of data (available in 4TB and 6TB versions). That large storage size, however, contributes to the massive size of the drive which measures 5.1 x 3.6 x 9.9 inches and weighs 5 pounds. It is strictly built for Mac and comes with two Thunderbolt 2 ports and USB 3.0 port as listed on G-Technology’s website – some other websites omit this important information about the drive. The G-RAID drive spins at 7200 rpm and believe it or not, the transfer rates are something else; reaching transfer speeds of up to 300MB/s as against the 480MB/s listed on the company’s product website. The drive actually, which was initially built to work on only Mac, now runs on Windows PCs and it is not surprising to note that the USB 3.0 is downward compatible with USB 2.0. There’s a 3-year warranty on the product. It is absolutely normal to expect a drive of this size to use an AC power source, and the G-Drive does require an AC power source. Out of the box, it works with a Mac, but you need to pay an extra $50 to purchase the Thunderbolt cable which isn’t shipped with the drive. For use on any Windows PC, reformatting is required. The drive is configured in RAID 0 and handles data storage pretty well. Oh, and lest we skipped that, the drive offers Thunderbolt 2 connection; that is twice the speed of Thunderbolt!!! Unbelievable, right? USB 3.0 and Thunderbolt 2 connection ensures fast transfer speeds. Conclusion: G-Technology did a great job producing such a wonderful storage device for people who have a penchant for large storage devices. 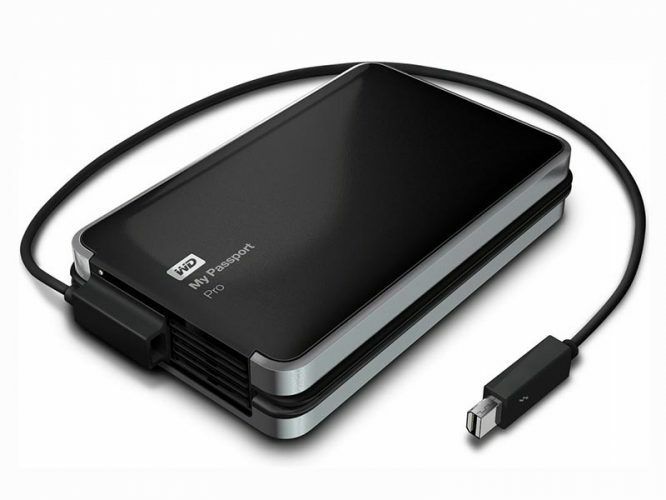 Although not the size of a passport as the name suggests, the WD My Passport Pro hard drive is a Thunderbolt portable hard drive for Mac users. It’s bus powered and has storage capacities of 2TB and 4TB. There’s no Thunderbolt port on the drive, rather, it has a Thunderbolt cable permanently attached to the drive and can easily be drawn out from the sides. The fan on the bus-powered drive is automatically switched on when the drive gets hot, which it rarely does. The drive is basically described as a portable RAID by many who have tested the drive’s ability to be configured in different RAID setups. It weighs about 1.6 pounds and 1.2 pounds for the 4TB and 2TB models respectively and measures 5.6 x 3.5 x 1.7 inches and 5.6 x 3.5 x 1.1 inches respectively. There’s no USB 3.0 port so it certainly isn’t going to work on your Windows PC. The drive rotates at 5400rpm and ensures good transfer speeds with its Thunderbolt ports. It works out of the box with Mac and Western Digital gives you a value for your money with the drive’s 3-year warranty. Conclusion: Users willing to pay a premium for extra speed and capacity at a time for their Mac are surely going to embrace this drive with both hands. It’s apparently a better option than some of its counterparts like the LaCie Big Disk Thunderbolt drive which only outranks it in terms of transfer speeds. Starting from late 2018, drive is only available as recertified product. 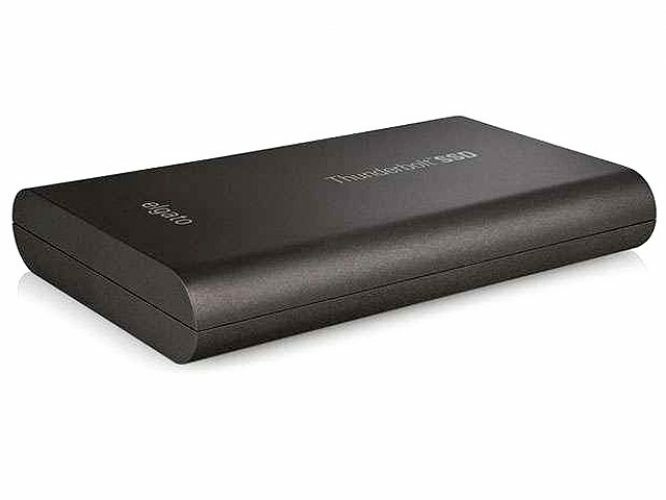 The Elgato Thunderbolt Drive+ is yet an awesome Thunderbolt drive that is worth owning. It offers both USB 3.0 connectivity and Thunderbolt although only one of the ports can work at a time – while using the Thunderbolt port, the USB 3.0 port will shut down and vice versa – a major downside of the drive. The drive’s SSD is built with the prestigious Plextor True Speed technology and comes in 256GB and 512GB variants, with the Thunderbolt and USB 3.0 cables included. Like some of the aforementioned drives above, the Elgato is compatible with Windows OS if reformatted but it works directly with Mac out of the box. Weighing just about 270 grams, the drive is housed in a sleek looking aluminum encasing with grainy finishing which helps keep the elements like dust away from the body. The drive measures 5.2 x 0.8 x 3.3 inches and weighs just about 0.5 pounds. The USB 3.0 connection of the Elgato Thunderbolt Drive+ is downward compatible with USB 2.0. Transfer speeds on the drive surpass 330MB/s as against the 420MB/s claimed by the manufacturers. The Elgato Company, which was known for manufacturing the Elgato Thunderbolt SSD, has been acquired by Corsair. As such, it will no longer be an independent company and will be united under the Corsair banner instead.This move is no longer surprising though, as Corsair is actually already known for getting involved in the gaming scene, particularly in the manufacturing of gaming peripherals such as PSUs, PCs, cooling systems, and more. What this acquisition means is that the Elgato Thunderbolt SSD will no longer be in production. The Elgato Thunderbolt was a combination of a speedy solid state drive and the unparalleled bandwidth of the Thunderbolt interface. As such, it was known to offer lightning-fast transfer rates aside from its ultra-portable design. Unfortunately, since the Elgato Company is now a part of Corsair, then the Elgato Thunderbolt SSD is no longer available. Therefore, we don’t recommend this drive anymore as there’s no point in promoting it when its manufacturer is already gone. Conclusion: In the words of Gavin Thomas, if you’re looking to backup your MacBook Air’s 128GB memory faster than it takes to boil eggs, then this drive is your best bet. Nicknamed “small but mighty” for its miniature chassis but powerful transfer speeds, this drive is worth mentioning. The fact that is smallish and portable is enough reason for the drive to be bus powered, but the reverse is the case. 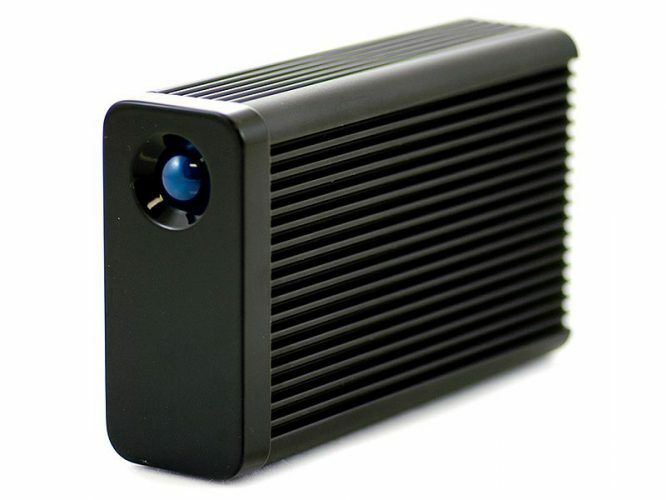 The drive requires an external AC power supply which is about half its size. The drive, however, makes up for that with its super-fast transfer speeds, thanks to the two Thunderbolt 2 ports at the rear of the device. On the front of the device which weighs 1.4 pounds and measures 5.5 x 1.6 x 3.3 inches, is the LaCie logo and the LED indicator which shows drive activity. 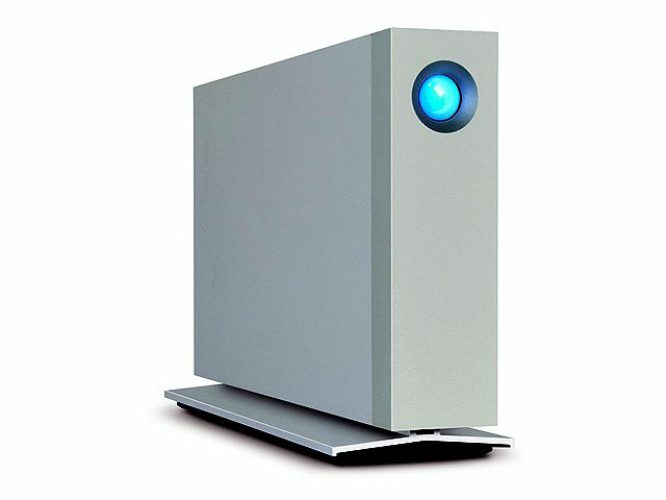 LaCie ships the Little Big Disk with a stand although the drive could be used without the stand. It works out of the box with any Mac computer. The Thunderbolt 2 ports also work with Thunderbolt laptops, so you should stop wondering if it will work with your MacBook that doesn’t have a Thunderbolt 2 port. The drive also supports RAID configurations. Your data on the drive is safe, thanks to the 256-bit AES encryption feature. Need I say that backup and managing the drive has been made easy with the Intego Backup Manager Pro? There’s a three-year warranty for the premium price you pay for such a device, and it is certainly worth it given the extremely fast transfer speeds. Conclusion: For $1000, you can experience the ultra-swift power of LaCie’s Little Big Disk Thunderbolt 2 if you prefer speed over large storage options. The LaCie Bolt3 drive comes with a simple yet innovative style which is designed by Neil Poulton. It’s available in a thin matte black enclosure which is mostly made of aluminum. It also features a magnetic display stand which lets you display the drive in an artistic angle and a short Thunderbolt 3 cable included. There are two Thunderbolt 3 ports. This allows you to daisy-chain five Thunderbolt 3 devices, one USB 3.1 device, or a single high-resolution display using a USB-C cable. Performance-wise, the manufacturer stated that it can reach read speeds of up to 2800MB/s. However, results from the AJA System Test using a 16GB file only indicated a sequential transfer speed of around 2500MB/s. Though it’s still quite impressive and is able to compete with other reliable Thunderbolt 3 storage solutions. Regarding write speeds, the Bolt3 exhibited a sequential write speed of around 1100MB/s which is only a few hundreds behind its performance benchmark of 1300MB/s. LaCie Bolt3’s fast transfer rates don’t come cheap though. Costing at a hefty $1999, it actually costs a couple hundred dollars more than the MacBook Pro which is priced at only $1799. However, though it’s expensive, it actually costs slightly lower than when you “build” a Thunder3 combo that has a 2TB capacity which will cost you around $1700 to $2100 depending on the flash blades’ model and brand. Conclusion: Despite its hefty price tag, the LaCie Bolt3 offers a really huge storage capacity and options which are geared toward the MacBook Pro. Aside from that, its incredibly fast and reliable performance will surely make it a worthwhile investment. This makes it really useful for editing 4K as well as 6K and 8K videos. The LaCie d2 drive has been on the market for quite some time now. However, the newer version has been converted to include Thunderbolt 3 connectivity for an even better and faster performance. Compared to its Thunderbolt 2 version, the LaCie d2 Thunderbolt 3 drive comes with better features and performance overall. That aside, what are the other changes that this newer version has to offer? Let’s find out. The d2 Thunderbolt 3 has a premium design which is closely similar to its predecessor. It has a heavy-duty aluminum enclosure which adds to the drive’s overall durability and longevity. Also, as is the case with the other storage devices from LaCie, this one has a very minimalist look and feel to it, especially on its front. Meanwhile, its rear panel comes with a USB 3.1 port and two Thunderbolt 3 40Gbps ports. You can even use the USB port as a 15W charger. Under these lie the power port and a Kensington lock slot. It can also support daisy-chaining several devices that are compatible with the Thunderbolt 3 technology. The d2 Thunderbolt 3 has a marketed transfer rate of 240MB/s which is slightly higher than its predecessor at 220MB/s. Various tests were conducted to figure out how fast and reliable the d2 Thunderbolt 3 is when it comes to performance. Results from the CrystalDiskMark test displayed 169MB/s of write speed and 76MB/s of read speed. Meanwhile, its sequential read/write speeds reached 240MB/s and 234Mb/s respectively. Other results which made through the ATTO Disk Benchmark tool confirmed the drive’s read speed of 240MB/s with a write speed coming in at 236Mb/s. Additionally, its write speed and performance is surprisingly better than the read performance when it comes to dealing with 4K data. From these data, we can confirm that the drive’s marketed performance is pretty accurate. That said, it’s a really well-performing HDD-based external drive. The d2 Thunderbolt 3 isn’t cheap though. Also, there are other options out there that have almost the same performance as the d2 Thunderbolt 3 but at a slightly lower price. Conclusion: Overall, the d2 Thunderbolt 3 is among the most reliable HDD-based external drives you can find on the market. Its sleek design isn’t just for looks though. It’s actually designed to keep it cool as well, and since most of the enclosure is made of a single aluminum sheet, it can be pretty effective at dissipating heat. Featuring fast sequential read/write speeds of 240MB/s and 230MB/s respectively, it surely is a great option for an external storage solution. Last, but certainly not the least in our list of top Thunderbolt storage drives for Mac is Western Digital’s My Book Dup Thunderbolt Drive. 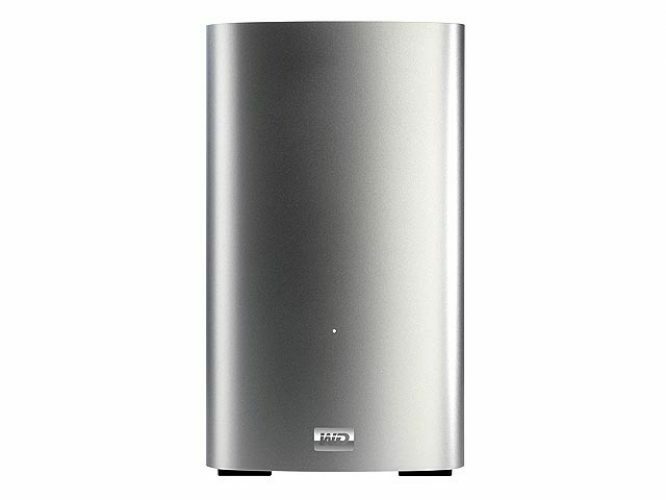 The large desktop drive with 8TB (4TB and 6TB available) worth of storage is enclosed in a shiny plastic casing. Weighing 5.2 pounds and measuring 6.5 x 6.2 x 3.9 inches, the Duo Thunderbolt Drive sports two Thunderbolt ports, and is configurable in RAID 0, RAID 1 or JBOD modes. The drive spins at 5400 rpm which should have been upped to 7200 rpm. Nonetheless, the Duo does transfer files at an incredibly fast speed. There are enough openings to ensure proper ventilation and reduce the drive’s chances of heating up during use. Inside the Duo are removable 3.5 inch SATA drives. The lack of USB 3.0 on this drive makes it imperative for anyone having any old Mac with USB ports to have a rethink. The drive is shipped with a Thunderbolt cable so you don’t have to worry about doling out an extra $50 for that. It works straight out of the box. Conclusion: If you solely want a Thunderbolt external drive with enough storage space for your needs and you aren’t really concerned about transfer speeds, then the WD My Book Duo Thunderbolt Drive is would be a great choice for you. But make sure, that you’re buying not a Recertified Product. The My Book Pro is Western Digital’s highly reliable RAID storage system solution. It features Thunderbolt 2 connectivity as well as ultra-fast transfer rates and a huge storage capacity. Basically, it’s designed for those who are looking for a fast and efficient way to manage massive amounts of HD content with ease. 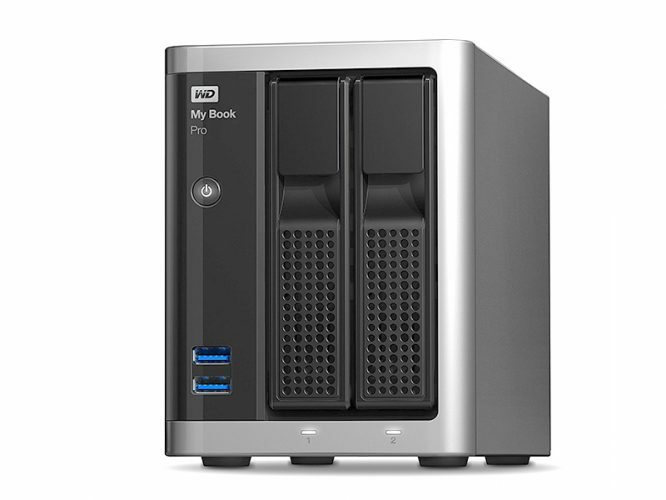 The My Book Pro’s design is closely similar to Western Digital’s line of NAS solutions. It measures 4-inches wide, 5-inches high, and 8-inches deep, making it a bit compact and easy to place on almost any desktop setup despite a very limited space. It also has that rugged look and feels to it with its grey metal chassis and a black-colored front panel. In the front, you can find two USB 3.0 ports for quick access; on top of them, you can find the power button and WD’s branding. You can quickly access the two drives on the front section through the drive door latches. Each drive bay has a status LED which gives you information regarding the drives. A steady white would mean that it’s powered on and ready to go, while a dimmer light means it’s on standby mode. Meanwhile, if the lights are red, it could mean that there’s a degraded RAID volume or perhaps a certain failure. If you turn it around, you’ll find a large ventilation which keeps the device cool. There’s also a Kensington security slot located right above it. On the right side, you’ll find two Thunderbolt ports, a reset button access hole, a DC power connected, and a USB 3.0 port. To gauge the performance of the My Book Pro, we’re going to take a look at several benchmark tests conducted to check if it’s on par with what Western Digital claims. According to them, the My Book Pro can promise transfer rates of up to 435MB/s. A test conducted using Black Magic Disk Speed Test showed that the My Book Pro was able to reach a transfer rate of 400 MB/s read and 412 MB/s write at RAID 0 which are very close to their promised speed. Though it’s not the fastest there is, with CalDigit T3 and T4 hogging the first and second spot, it doesn’t fall behind either as it placed itself on the third position. Meanwhile, it exhibited some impressive read/write speeds at 183MB/s and 214MB/s respectively at RAID 1. Conclusion: Overall, the WD My Book Pro is an excellent solution for those who need a massive storage solution with high performance. Aside from that, it’s backed by a three-year warranty and is available at a fairly affordable price. Selecting the aforementioned Thunderbolt storage devices was based on certain criteria such as speed, storage capacity options, its compatibility with Mac and Windows as well as encryption features. The Thunderbolt External Hard Drive Buyers Guide at the end of this post will enlighten you more. Meanwhile, here are a few things you should know about Thunderbolt storage. What is a Thunderbolt in terms of storage drives? Isn’t thunderbolt a flash of lightning with a simultaneous crash of thunder? Thunderbolt is simply the brand name for Apple and Intel’s technology for connecting external devices to computers. Thunderbolt arrived early 2011 alongside a couple of Apple’s MacBook models. It was designed in such a way that it could support electrical or optical connections on up to 6 devices that could be daisy chained whilst transferring data at speeds up to 10Gbps and also providing the devices with as much as 10 Watts of electrical power on a single port without any hubs. If the Thunderbolt could be that powerful, what about the Thunderbolt 2? Intel in 2013 announced the introduction of the Thunderbolt 2 which was an advanced modification of its predecessor. The Thunderbolt 2 had twice the transfer power of the Thunderbolt – 20Gbps as against the latter’s’ 10Gbps. To achieve such a feat, the developers joined 2 existing 10Gbps channels of the Thunderbolt cable to form a single channel with the 20Gbps. The Thunderbolt 2 was released with the 2013 MacBook Pro. Then came the Thunderbolt 3, which was designed to handle twice what the Thunderbolt 2 could only support. In clearer terms, the Thunderbolt 3 had a transfer rate of 40Gbps while providing devices with as much as 100watts of power. Quite incredible I must say. The USB 3.0 can only be compared to the first Thunderbolt; the difference between it and the other versions are glaring! That notwithstanding, people still prefer the USB 3.0 to the Thunderbolt because it is relatively cheap. That was eye-opening, wasn’t it? Now here’s the real deal. With a wide array of drives to choose from, it is imperative we provide our readers with tips to guide them in making the right choice in choosing the best Thunderbolt storage drives. Here’s a clear elaboration of the factors mentioned above. Portability and ruggedness: There’s no gainsaying that people prefer portable drives to desktop drives. If the drive will be sitting at your desk all the time, then you should just get a desktop drive – bus powered or not. However, if you intend to carry your Thunderbolt hard drive along with you wherever you are going to, then you’d need to get one that is small, weighs about 0.5 pounds and is bus powered. More so, if you are taking the drive along with you to a rough terrain, you might want to consider a rugged Thunderbolt hard drive. The ruggedness of a drive ensures that they can withstand elements such as dust, water, and bashing or falls from certain heights, as well as certain weights being placed on it. Reliability and durability: A reliable drive ought to have positive reviews on sites like Amazon where have been many buyers before you. Why would anyone still buy a drive that a handful of users reported exactly the same problem? Reliability matters a lot and as such shouldn’t be overlooked. More so, some drives do claim they can withstand certain conditions when it’s obvious they can’t. That said, durability also comes to mind. Thunderbolt hard drives and general hard drives with just one year warranty aren’t worth owning at all. Hence, there’s need to purchase drives with at least two years warranty. A three-year warranty is much better. Speed: While it is important to consider the speed of a drive, it doesn’t really matter to people who just need a storage device. Thunderbolt storage drives are fast when it comes to transferring data. As a matter of fact, they are faster than USB 3.0 in most cases especially when they are paired with SSDs. In some cases, however, the USB 3.0 often surpasses the Thunderbolt drive in terms of transfer speeds. It is also pertinent to note the RPM of drives. Drives that spin at 7200rpm are better than those that spin at 5400rpm. Thunderbolt hard drive storage size: The available storage space on a drive is important. Hence, if you require more storage, 4TB drives would be a good option over the 1TB or 2TB drives. Does Thunderbolt hard drive needs encryption: Some Thunderbolt drives provide the end user with the option of encrypting their data using 256-bit AES encryption. However, if safeguarding your data from prying eyes isn’t a priority, then you might as well overlook the fact that a drive has no encryption feature. More so, Thunderbolt hard drives are mostly meant for Macs although it can be used on a Windows PC if only it has a USB 3.0 port and is formatted in NTFS or exFAT. Don’t buy a Thunderbolt drive without USB 3.0 and expect it to work on just any Windows PC. There are some Mac computers without USB 3.0 ports, so if your Thunderbolt external hard drive doesn’t have any USB 3.0 ports, it simply means you’ve just wasted your funds. Thunderbolt Connection Type: The Thunderbolt technology has grown over the years since 2011, and has given birth to Thunderbolt 2 and Thunderbolt 3 technologies. Most Macs, however, support only Thunderbolt and Thunderbolt 2. Ensure that you check which your Mac supports before buying any of the drives. What Does a Recertified Hard Drive Mean? When buying a hard drive, you might come across the term “recertified”. If you have purchased several drives before, this label might come as a surprise, especially since it’s only found on a number of drives. What exactly does the term “recertified” mean when it comes to hard drives? Let’s find out. A hard drive that’s been recertified means that it’s been tested by its manufacturer at the factory to ensure that it’s reliable enough to be used by a customer. This process is something that can only be done by the manufacturer themselves. Therefore, a drive that has the “recertified” label simply means that it has passed both quality and reliability standards. However, the testing process may vary. In general, a special drive testing equipment will diagnose any faults present then correct them via marking out bad blocks or changing some of its physical components. Once the repair is complete, it will then go through another testing phase in the same way that a new drive would. If it passes, it will then be labeled as recertified. Generally, drives which are recertified are considered reliable as they’re tested by their manufacturer. However, the extent of reliability might be hard to determine even by the manufacturers themselves. To provide a rough estimate, the drive’s cost, as well as warranty, can help indicate its reliability. Almost all hard drive manufacturers like Seagate and Western Digital sell recertified drives. In most cases, a huge PC manufacturer will order batches of new hard drives straight from a factory. A certain percentage of those drives may come with defects which are detected by the technician upon testing and are thus returned to the manufacturer. Upon arrival, the manufacturer will then re-test the defective drives to diagnose the problem. This will also let them avoid such problem in the future and design even better drives. Hard drive manufacturers normally receive a number of returns from all around the world. Once those returned drives pile up, they will represent a loss. Therefore, the manufacturer will then appoint a special repair department to test the faulty drives and make them work. These newly repaired drives will then undergo stricter quality tests than a new drive would. Should You Buy a Recertified Drive? You might be tempted to buy a recertified drive due to its fairly cheap price. In fact, a lot of people find themselves asking whether it’s worth it to buy such a drive or not. After all, such drives are readily available in a variety of sources online such as eBay and Amazon where they are marketed at a really affordable price. Before you even think about buying a recertified drive, take the time to check if it includes the manufacturer’s brand on it. Also, make sure that it’s from a reputable manufacturer such as Western Digital. If it is, then there’s a high chance that it’s reliable for use. On the other hand, if it’s from an unknown manufacturer or doesn’t have any branding, then you might want to avoid it. It’s also a good idea to check if the drive comes with a one-year warranty. Make sure that the warranty is provided by the manufacturer itself instead of the seller. This way, you can be confident that it’s a reliable and worthwhile acquisition. Also, if the seller describes it as recertified, it’s also a good thing as he’s being honest about it. There are lots of online sellers out there who would remove the label from a recertified hard drive then sell them at the full price. If for any reason you need clarification on any issue, please do not hesitate to leave a comment. We’d be glad to answer your questions. Choose wisely your Best Thunderbolt hard drive 2019. I have the habit of mass transferring my photos and videos from my smartphone. It takes minutes and I thought it was because of big file sizes. Now I know the potential of Thunderbolt and that I am late in the game. It has already developed to 3.0! Maybe my next external hard drive will be a Thunderbolt–hopefully by then it will become commonplace enough to be more affordable. Do you think that will happen in the next 3 years? I needed a good external hard drive because the space on my laptop is really low which makes every process on it extremely slow. I however have observed that when you try to transfer something from a full hard drive on your laptop then the process can be pretty slow, even though you use USB 3.0, is that a problem in the Hard drive? Your laptop could support USB 3.0, but may be you are still using external drive with USB 2.0 support. Or if your laptop drive is full enough and needs de-fragmentation. Thank you for describing the fundamentals of hard drive features. Maybe the Thunderbolt 3 is pricey but with the benefits you mentioned, I am guessing it’s worth the money. Mentioning that, is there any recommended external hard drive that has such interface which is twice as fast as Thunderbolt 2? Twice faster than G-Raid and LaCie Little Big Disk. Hi and thank you for the detailed review. So, I understand the Thunderbolt technology is mostly about transfer speed, am I right? I have never had a MacBook so I was quite surprised to hear most of them have a limited 256GB hard drives. If this is the case, Mac owners clearly need an external HDD as well. I am just wondering what are the price differences between the HDD with and without the Thunderbolt technology. And if the latter are more expensive, then how much I (the average Joe from the street) benefit from it. Am I right that all these HDD’s reviewed here are Windows 10 compatible? I actually just bought a 2TB external hard drive. I can’t remember if it was made by Thunderbolt or another company. All I know, is that they are so useful and handy for organizing files you might not have space for on your laptop or computer. One thing I tried doing and am a little disappointed of is playing videos with it through my TV. But, unfortunately my TV for some reason hasn’t been able to recognize the media on my device. Maybe I need to re-format the hard drive, not sure. Anyway, thanks for this great article. Maybe I’ll try going with a different brand! Wow, thanks for such detailed reviews. I’ll be looking into all of these. I bring my laptop with me everywhere, and after my last one died without me having the ability to back it up before that occurred, I’m now aware of the importance of it. These all look like great options, but I’ll be weighing the pros and cons! This is a great review. I work in an electronic store and these hard drives have always confused me. It is hard to direct a customer to the right product when I don’t understand how they work or what they should look for. This article goes a long way to helping me with this issue. THANKS! so for WD is it 8TB the maximum capacity there is ? or is there bigger storage than that ? Hey Elbert, yep there are definitely larger hard drives on the market than 8TB, but I don’t recommend using them. Remember the old saying: “don’t put all your eggs in a basket”. 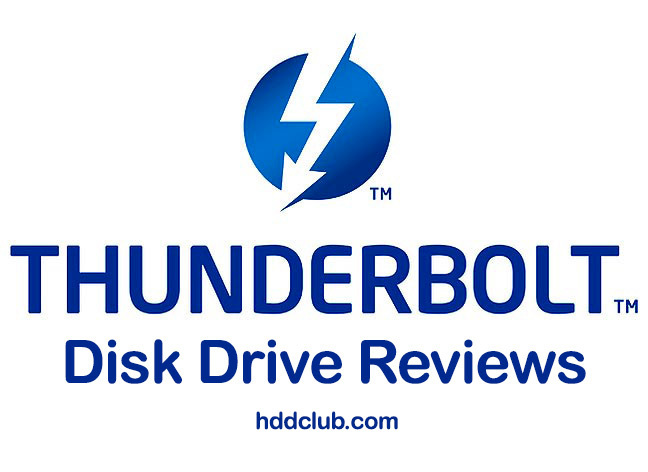 I just finished reading your review of Thunderbolt External Hard Drives. You did a good side by side comparison here. 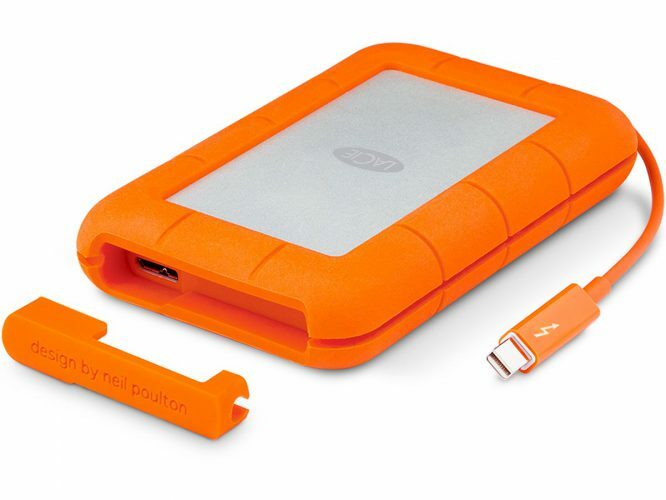 I am in the market for a new external hard drive to be used for my professional employment and I was leaning kind towards the LaCie Rugged RAID, mostly because I am hard on gear and the more rugged the better. However I you now have me rethinking and I am going to take a closer look at the Transcend Storejet 500.
i just bookmarked you, so i will be back! Thanks for a great read, see ya soon. I still do not understand though, why someone should get into the hustle of picking an HDD with a different technology than USB 3.0. Many of these HDDs might not be compatible with both Mac and PC. For someone that uses both environments, this is a red flag. Being a computer guide i do feel impressed of how far can manufacturer push their products. I mean sometimes it make sense and sometime not. Thunderbolt can work perfectly on ssd as there are no moving part. That is fine but for HHD, thunderbolt is not overkill because of a difference in speed of transfer? Thanks for a great review on these external drives. I have been thinking about getting an external drive, but have been getting by using USB 16GB sticks for a long while. For someone who needs a lot of storage space, like someone who downloads large files(such as movies), these drives would be an excellent choice. My world involves excel files, images, and Word files, so don’t really have an urgent need for an external drive yet. USB sticks are much lighter and portable, and suit me fine, so far. I was looking for some drives that were Thunderbolt compatible just the other day. I do music production and also run a site on music production. These would be extremely useful for people who work from sounds and samples stored outside their computer’s main HD, like myself. I’m not on a Mac user, but I may get one in the future, simply because of the Thunderbolt capability. So I’m glad I came across this post. I like the information and comparison about the Thunderbolt External Hard Drive with the Pros And Cons but I would like to know which one is highly recommended by you or you personally prefer to use with the largest capacity, reliability and durability because from what I know the largest the capacity is the less durability of the External hard drive. You know the old saying: “don’t store all eggs in one basket”. So I do not recommend using hard drives with 8TB and above. If you need to store important files, better to use several drives of 2TB / 4TB. This LaCie Rugged drive looks so great and awesome. I mean a hard drive that a Range Rover runs over it and still able to retrieve data from it looks so great. I really like it and I’m wondering how I can get one to buy. Do you think Amazon is the best place to get place to buy it from as you recommended? I will really be happy to hear from you. Thanks a lot for sharing this wonderful post with me. Thunderbolt for Mac and Solid State Drives for Windows users have marked a turning point in computer’s speed. More and more people are realizing that traditional hard drives are not capable of delivering fast transfer speeds. I have never owned a Mac, I think they are way overpriced but I must admit that the Transcend StoreJet 500 and the WD My Passport Pro look really slick although the latter being an HDD. The thing I wanted to ask is how those thunderbolt SSDs are performing against Windows SSDs like my Samsung 850 EVO for example? Are they quicker or slower in terms of transfer speeds? One important note about the LaCie bigdisk products… their default configuration is RAID 0, which *drastically* increases the chance if data loss in the case of failure. They have been incredibly unhelpful in the case of hardware failure, suggesting only expensive clean room recovery, or purchasing an identical device, swapping drives, and hoping it works. They have refused to share even trivial information about how previous drives were configured to help recovery efforts. As a professional computer technician for 20 years, I think relying on this device for back up is questionable, and storing important data on it without additional backup is practically negligent. Do not use RAID 0 for important data. After looking through all these drives, my top choice would be the LaCie Rugged simply because its casing is so well-built. I like the fact that it comes with a protective gasket as well to help retard the shock from being dropped. I may have overlooked, but can this drive be used on a PC? Can ANY of these drives be used on a Linux computer? You can use any of these drives on any machine as long it has thunderbolt connection. Usually PC don’t have it… And re-formatting is really easy to do. Excellent comparison and explanation of external drives. Very thorough and informative. I did not know that USB3 could be faster than Thunderbolt. Makes you think about Thunderbolt as a standard. Is it really necessary? Apple always did their own thing and this is probably not going to change. Enjoyed reading your very knowledgable article. Thanks for the thorough review, I’m considering buying an additional drive and I found it really helpful. Currently, I use a Transcend and I’m considering going for more of the same. I’ve found the Transcend to be fast, efficient and in the couple of years I’ve been using it, no problems at all. I use it via USB 3 as you allude to in your review. I’m curious though. If price were not a consideration, what do you think is the best option to go for? I always find it a bit difficult to make up my mind, so your advice would be much appreciated! I didn’t know there were so many different hard drives out there, and I didn’t know that they were so different. It sounds like the Thunderbolt is the most popular and is the fastest. Your article was timely for me, because my macbook pro is running out of space, and I need to get a hard drive. Great and insightful review, thank you! I don’t own a Mac, although I’ve been looking into buying one in the upcoming months. Do you believe a Thunderbolt-enabled drive is better than the Seagate?